Matthew Pickering, driver for Samworth Brothers Supply Chain, won the 2016 FTA Driver of the Year Award on November 2nd. Along with a trophy, Mr Pickering received a £1,000 holiday voucher. The second- and third-placed runners-up received an iPad and £250 Red Letter Day voucher respectively. During the competition, which rigorously assessed contestants over a three day period, drivers were tested by various criteria, including driving skills, their grasp of the law and their knowledge of their vehicles. Fuel economy, manoeuvring skills, behaviour on the road and the driver’s ability to spot faults with the vehicle before they climbed in to begin a shift were all put to the test. Mr Pickering, who has been driving for 26 years, won the Truck Driver of the Year Award (44 tonne) in July this year; and a look back over his long career makes it clear why he was able to win both of these prestigious awards in one year. Mr Pickering has worked for Samworth Brothers for the past eleven years, but his first driving job was with pick-up trucks and vans. He later took to driving a Bedford TK cattle lorry, followed by an ERF 18 ton rigid (delivering frozen chickens). His background in chilled distribution has clearly served him well, laying the groundwork for his current role in Samworth Brothers, and his latest achievement in becoming FTA Driver of the Year. Samworth Brothers Supply Chain is not only a highly regarded distributor, but also a high quality producer of sandwiches, desserts, pastries and cooked meats, having won 35 awards last year. 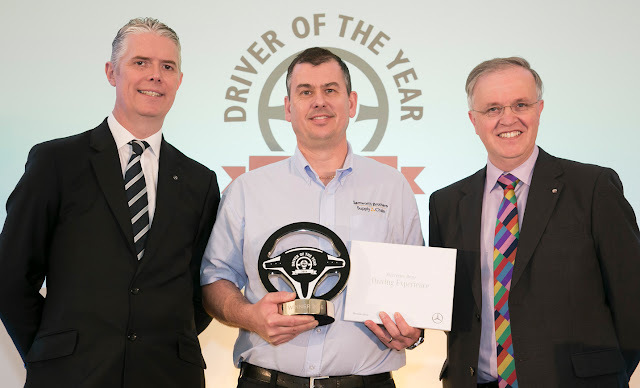 Mr Pickering was reportedly “very proud” to have won Driver of the Year last week. “I hadn’t realised how big a contest it was until I became involved and it means so much to get the respect I now receive from my work colleagues,” he said in an interview after receiving the award.